Worlds Largest Margarita for Jimmy Buffet, lets to do something Spectacular for you. How do you get to Margaritaville? One way is to make the World's Largest Margarita! It's simple. Just fill a tanker truck with 5,280 gallons of Mott's Margaritaville Margarita Mix; drive the truck from Rochester, New York to Universal CityWalk, Orlando; fill a two-story, 7,500 gallon "glass"; add 437 gallons of Rose's Triple Sec and 1,321 gallons of Margaritaville Tequila; mix well; chill with 17 tons of ice and serve. Whew! Where is Margaritaville? From May 18 to 20, 2001, it was at the home of the World's Largest Margarita in Orlando, Florida. Mott's, the makers of Margaritaville Margarita Mix, joined forces with Jimmy Buffett's Margaritaville at Universal CityWalk to break the Guinness Record by creating a two-story, 7,000-gallon margarita, which was simultaneously deemed the world's largest cocktail. "What could be more fun than to be involved in the creation of the 'Big Rita' - a tropical location filled with good friends, great entertainment and the biggest margarita anyone's ever seen or attempted to drink," said Tony Jacobs, marketing director - Mott's. "It truly brings to life the meaning of the Margaritaville state of mind. Fortunately, everyone can visit Margaritaville without having to figure out where to put all that ice! Just open up a bottle of our mix and add tequila - it's a lot easier and tastes just as good." "It's a great way to kick off the national launch of our Margaritaville Margarita Mix. "Mott's Margaritaville Margarita Mix begins its national distribution in grocery, liquor and restaurants the first of June. "Big Rita" is 18' high and 12' wide. "Big Rita" weighs 3000 pounds empty. "Big Rita" weighs 64,000 pounds full (32 tons). It took 2 days to make the record shattering Margarita & Cocktail. "Big Rita" holds 44,800 Each 20 oz. Margarita's. 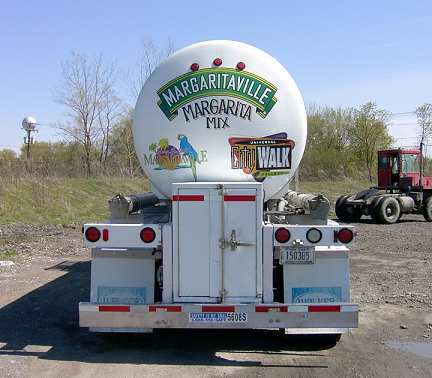 Preparations began Saturday, May 12th when the 6000-gallon beverage tanker truck was filled with Margaritaville Margarita Mix in Williamson, NY. 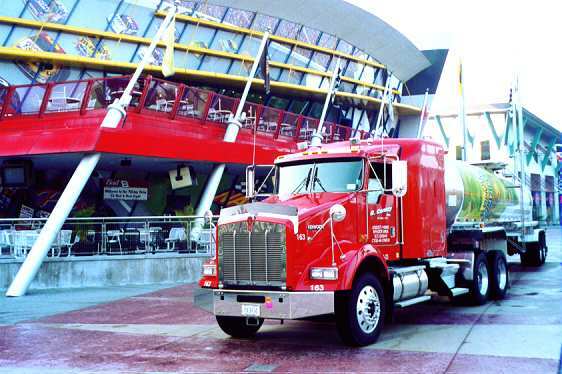 The truck was also "wrapped" with colorful graphics to let everyone know what's inside and where it was headed ("Universal Orlando or Bust") on its trek. After a stopover on Monday May 14th for a kick-off christening party at Mott's headquarters in Stamford, Conn., the mix was on its way down the coast via I-95 to Universal CityWalk. Once there, the mix was transferred into the "glass" created just for the occasion, which was actually a 7,500-gallon, FDA-approved polyethylene tank and Margarita Mixing system by AlltankCom. of Houston, - ( Tanksystems.com ). Adorned with a giant lime, salt and the requisite straw, "Big Rita" weighed in at more than 32 tons when full. The recipe, created by mixologists at Mott's headquarters and Jimmy Buffett's Margaritaville, was 12 parts mix, three parts tequila and one part triple sec. At 7,039 gallons, the potable concoction broke the current Guinness cocktail and margarita records of 6,853 and 5,712 gallons, respectively. The Cone Bottom Tank and dispensing system design was provided by American Process Technology, Inc. The "World's Largest Margarita" event was the kick off to the first annual Holidays Parrothead Festival, a wacky and fun event with lively entertainment - along with over 1,000 zany Parrothead (die-hard Jimmy Buffet fanatics). The madcap event began Friday evening, May 18th with the topping off ceremony of "Big Rita" and continued through Sunday, May 20th. A portion of the festival food and beverage proceeds benefited Hands on Orlando and the Orange County Children's Advocacy Center. Mott's Inc., a subsidiary of London-based Cadbury Schweppes plc (NYSE: CSV), is headquartered in Stamford, Conn. Mott's is the nation's leading producer of cocktail mixers with such popular brands as Holland House and Mr. & Mrs. T, the top selling cocktail mixers in the United States and Rose's, the nation's leading brand of lime juice and grenadine. Other well-known products made by Mott's include Mott's Apple Sauce and Apple Juice, Mott's Fruitsations, Hawaiian Punch fruit drinks, Clamato, Mauna La'i tropical juice drinks and Grandma's Molasses, the number one brand of molasses in America. More information about Mott's can be found on its web site, www.motts.com. Universal Orlando is a unit of Universal Studios, a part of CANAL+, the TV and Film division of Vivendi Universal, a new global leader in media and communications. The Universal Orlando resort destination (www.universalorlando.com) includes two dramatically distinct adjacent theme parks, the Universal Studios motion picture and television theme park and Islands of Adventure, Orlando's next generation theme park. Universal Orlando also includes CityWalk, a 30-acre dining, shopping, club and live-entertainment venue as well as premier on-site Loews hotels and world-class film and television production facilities. TanksystemsCom was pleased to provide the 7500 gallon Cone Bottom Tank and Margarita Mixing System to Jimmy Buffets' Margaritaville Restaurant in Orlando Florida USA.